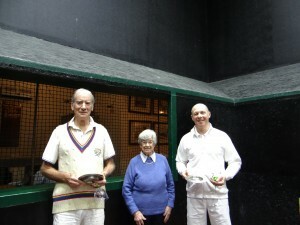 Last weekend we had some fantastic handicap tennis played at the club. The Secretary’s Cup is great as it is a random draw for partners which means that members are likely to partner someone they might not have met before. In the group stages we had 7 sets that went down to the last game and all of the groups were very close. On Sunday the play off group had all 5 pairs finishing with two wins and so went down to game difference with three going through the quarter-finals. Simon Brett and Tom Compton battled their way to the final to take on Stuart Allison and Oliver Harris. The final was extremely close and at 5 all it was looking like a 7 all forty all was on the cards but Stuart and Oliver managed to raise their game just enough to see them through with an 8/5 victory. Our thanks to Philip and Lyn Robinson and Andrew and Sally Falk for once again producing a great lunch on both Saturday and Sunday and congratulations to Oliver Harris and Stuart Allison on an excellent tournament. Congratulations to all the winners! Keep it up guys! Field Trophy Final – PHTC pipped by Seacourt! PHTC Invitation Doubles Tournament in brief! JB on View of the new roof – We are on the home straight! Mitch on View of the new roof – We are on the home straight! David Bevan-Thomas on View of the new roof – We are on the home straight!